I’m not very old, but for much of my youth in the north west of England, it was almost impossible to find fresh foods that weren’t local. Today such a statement seems like an echo of Victorian times, but, literally, that’s how it was until a supermarket was built behind the Knutsford courthouse in the late 80s. I often tell my wife about the cheese stall at the weekly market only kept five kinds of cheese – Cheshire, Cheddar, Lancashire, and sage Derby were ever present, with perhaps a Wenslydale reasonably common too. If anything as unusual as a Stilton, from distant Nottinghamshire, appeared, it would generate as much commotion among the town’s housewives, who elbowed their way to the front of the queue to catch a glimpse of this highly perfumed foreigner, as if Julio Iglesias showed up sporting his tennis shorts. My wife usually responds that I should count myself lucky because when she was young there were only four kinds of cheese at her local supermarket: white American, yellow American, cheddar and Swiss and had anything else been available it would have been looked upon with extreme suspicion. Touché. Making our weekly Tuesday rounds of the covered (indoor) market (the outdoor market sold mostly fruit and veg, bric a brac, and live pets, believe it or not) with my mother, on the cheese man’s left was the egg man, or “mister Chookie” as I knew him, on account of his perennial sales pitch “come tek a look at these lover-lee chookie eggs I’ve got for yuh!”. Unlike his fellow stall-holders, whose wares fell within a particular genre, the egg man also sold milk, orange juice and yogurt due to him being one of the younger siblings of the Sheldon family that owned the local dairy, and who, excepting market days, delivered these provisions to the doorsteps of the town’s residents. Beyond Mr. Chookie was the fish man, Mr. Scales, as my mother used to call him, although at the time her pun was lost on me. Above his stall ran the legend “fresh daily from Fleetwood, Lancs”, referring to the port just north of blackpool where much of Britain’s catch was landed. That his stall was only open Tuesdays and Thursdays didn’t seem to matter. Whether it was due to her upbringing in blackpool where there is – rightfully – a great deal of local snobbery about the quality of the fish that goes into their fish n’chips, or whether because of an innate suspicion of fishmongers, my mother always eyed mr scales’s wares closely, casting a wary eye over his glossy fish, as if trying to discern if there was anything untoward hiding among the cockle-shells. Because we rarely had fish except on Fridays when we weren’t allowed anything else – even in our lunchboxes at school we had to mark the end of the week with evil-smelling “salmon paste” sandwiches – and because mum worked a full day on Thursdays, whatever we bought on Tuesdays had to last on ice in the bottom of the fridge until then (freezing fish made it taste all woolly, she always said), so freshness was absolutely crucial otherwise it/we wouldn’t survive. 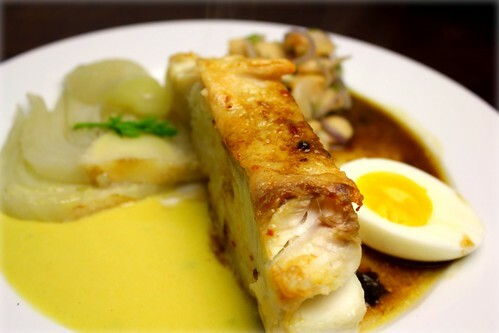 Typically, the fish was cod, but often halibut or hake did service in the flaky white fish department. This was usually broiled and served with oven-baked chips, since as a nurse my mother couldn’t countenance deep-frying at home lest it give the townies the impression she was a hypocrite in her dietary exhortations, and homemade mushy peas, flecked with mint and tangy with a splash of malt vinegar. Apart from a distinctly non-traditional and rather dodgy-looking “curry” she made every so often, friday night fish suppers were my dad’s favorite – he still demands it to this day and he is about as agnostic an Anglican as you’ll find. Instead of waiting for Friday, and going against my mum’s rubric of no-frying, but keeping with the buying of white fish on a Tuesday, we made a version of the Provencal classic, aioli garni, with a pan seared halibut fillet, steamed fennel and butter beans. Rather like much of the cooking I experienced growing up, it doesn’t look like much on the plate – the pale colors and the two sauces lapping against one another may seem bland – but the sharp tang of the garlicky aiolli with the surprising hot peppery-bite of the brown sauce against the muted flavors of the white fish and butter beans makes for an unusually rewarding dish. I am convinced that my mum would’ve enjoyed this dish a great deal, even though she would have asked why we didn’t save it for Friday night. As for my dad, well, sadly, he wouldn’t touch it on account of it humming with garlic. Too bad for him. In a small saucepan on medium heat, sweat the red onion gently in olive oil until soft, but still pink and with some texture. Add butter beans, season with salt & pepper and some chopped fennel tops, and another good jigger of olive oil. Keep warm until service. To make the brown sauce, in a saucepan, sweat the carrot, leek, celery and spanish onion together in some butter until soft. Add hot pepper. Increase heat to high and add cognac. Allow to reduce by half before adding fish sauce and fish stock. Simmer for 30 minutes. Strain and stir in remaining butter, keep warm. Either boil or steam fennel until soft – 5-8 minutes depending on technique. Crush and finely chop garlic with a sprinkle of sea salt. In a large bowl, mix with egg yolks and lemon juice, then whisking constantly, (or with a stick blender) begin adding the olive oil slowly. When you’ve got an emulsion going, you can add the oil more quickly, but if the whole thing breaks, have a glass of wine and start over again from scratch. In saucepan over medium-high heat, add two or three tablespoons of olive oil, and, having seasoned the fish fillets with salt and black pepper, place them skin-side down in the pan. Cook until skin releases from pan, 3-5 minutes depending on size of fillet, turn and place in oven for a further 5 minutes. 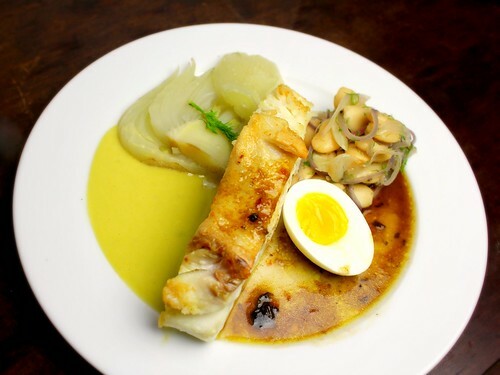 Plate beans, fish, fennel together with aioli and brown sauce. Soft boiled egg optional. Garnish with fennel tops and enjoy with a crisp white or Provencal rose wine. You have a lot of wonderful things going on with the dish.. love all the flavors you pulled together… can’t wait to give it a whirl… butter beans and fennel are a lovely combo as is the hint of the East with the fish sauce. Btw, I am with your wife… most of the markets where I grew up had NO choices… but much of the cheese was fairly local… from WIsconsin (I was just outside of Chicago). It was a brave new world when i entered my first cheese store (or fish store… we got perch and trout or it was SOOOOO frozen! Great story! I love traditions like fish friday… especially remembering them and being able to delve back into something that felt so automatic as a child as an adult. On the contrary- the colors look fabulous on the plate. Bravo for this dish, not a staged photo, just real, and really tasty. Mr. Scales… hahaha that is hilarious!!! I love it, I will call from now on Señor Escamas to my fishmonger. I love everything in your dish: the fish, the sauce, the veggies, the egg… Will you invite me someday to your table, Jonny? “…until a supermarket was built behind the Knutsford courthouse in the late 80s”. Fabulous sentence. Thanks for the recipe; we have a fishmonger newly arrived in our small Herts town and I’m determined to keep him busy enough to stay, even if I have to personally buy everything on his stall every week. This will be an excellent start. You must have been very posh in your part of the North if your mushy peas were flecked with mint – where I grew up in The Wirral, we only had the vinegar. @SallyC: thanks for visiting us. Posh is a relative term. That we had mint was because my granddad, a retired bank manager, who lived with us, was raised on a farm in Ashbourne, Derbys, preferred to grow his own rather than spend any of his money. The peas were often home grown too. Sounds wonderful, but in season, we had them six nights a week. Love the story! And this dish sounds very tasty. I think it looks fantastic on the plate! I do happen to love fish and chips, but you’re fish meal sounds lovely with the two sauces. Love the fennel and egg served with it too. ← Mariah Carey Makes Me Want to Eat Ecuadorian Ceviche!